Daseke Family of Companies’ Commitment to Safety Pays Off in Thirteen Awards - Daseke Inc. The Daseke family of open-deck specialized carriers has built a reputation for handling the biggest, bulkiest and heaviest of cargos efficiently and safely. Lately, they’ve been hauling away items you won’t ever see on their diversified fleet of trailers, but for what they represent to drivers, customers and others on the highway, they might be the most significant cargo of all. That cargo type: Safety awards. Thirteen national and state safety awards to be exact. Patrick Kuehl, executive vice president of Great West Casualty Company (at podium), acknowledges several fleets honored with top safety awards for their outstanding safety records in 2016 at the Truckload Carriers Association’s Annual Convention in Nashville, Tennessee. 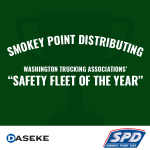 Smokey Point Distributing in Arlington, Washington, placed first in TCA’s National Fleet Safety Awards in Division III (15 million to 24.99 million miles a year). It’s the second year in a row Smokey Point has won the prestigious award. Those will go on the display shelf next to the Washington Trucking Association’s Safety Fleet of the Year award in the common carrier category (more than 5 million miles) that Smokey Point won last year. J. Grady Randolph, headquartered in Gaffney, South Carolina, also made a haul of SCTA safety awards, winning second place in the tank-local category (less than 500,000 miles), second place in the general-intercity category (500,000 to 1 million miles), first place for tank-intercity (less than 500,000 miles), first place for tank – combined (less than 500,000 miles), and first place among heavy haulers (500,000 to 1 million miles). 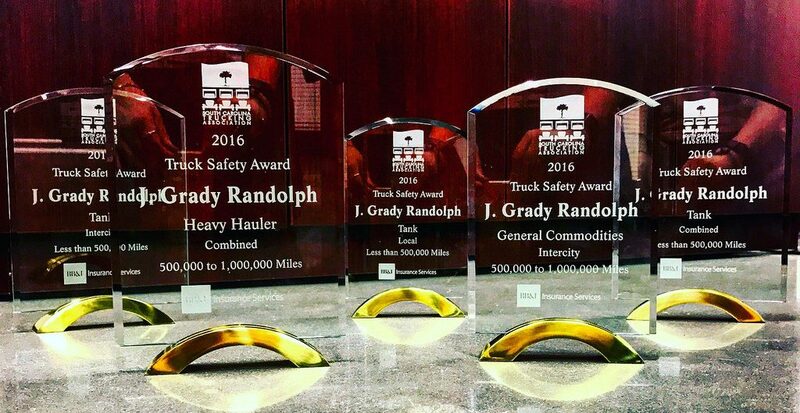 J. Grady Randolph displays its haul of annual safety awards in five categories from the South Carolina Trucking Association (SCTA). Bulldog Hiway Express, based in Charleston, South Carolina, placed third in Division II (5 million to 14.99 million miles) of the TCA National Fleet Awards. 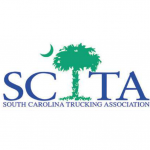 In the South Carolina Trucking Association’s annual safety award, Bulldog Hiway Express took second place in the general-intercity category (1 million to 5 million miles), first place for heavy haulers (less than 500,000 miles), first place in the general-combined category (1 million to 5 million miles), and first place for general-local (1 million to 5 million miles). In addition, last year two Bulldog drivers were named the SCTA’s driver of the month, Guy Pippin in May 2016 and Gregory Lynch in October 2016. Bulldog Hiway Express displays its top safety awards in four categories and two driver of the month awards from the South Carolina Trucking Association (SCTA). 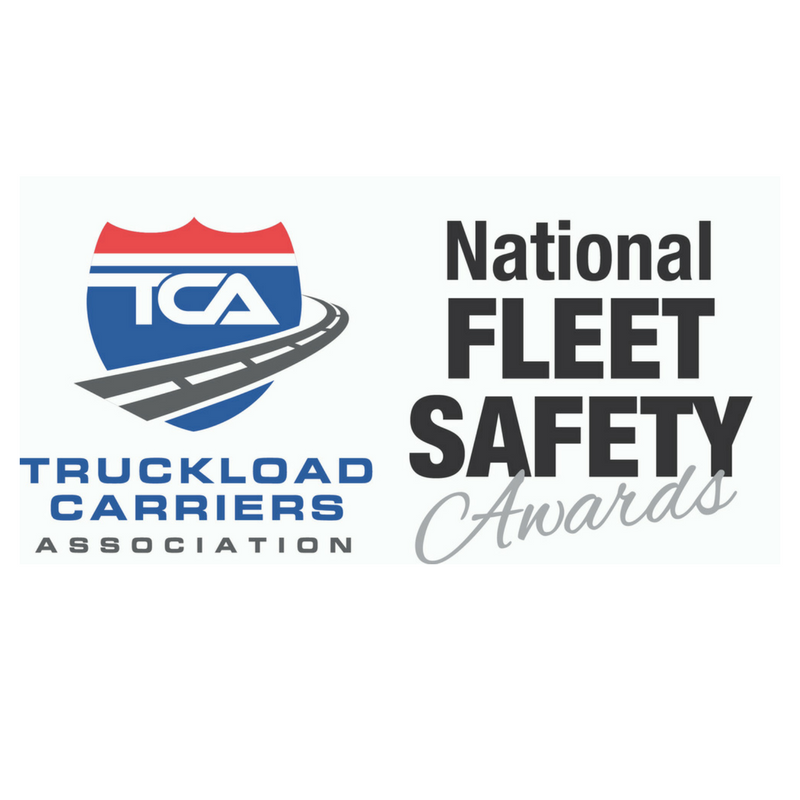 Big Freight Systems, one the newest Daseke companies, headquartered in Winnipeg, Manitoba, was a National Fleet Safety Award winner (under 25 million miles) in the Truckload Carriers Association (TCA) 41st annual National Fleet Safety Awards. They also took an award home for winning in their division. “I am very proud of our team for winning so many major safety awards,” said Don Daseke, president and CEO of Daseke Inc., the largest owner and operator of open-deck specialized transportation capacity in North America, with a fleet of more than 3,500 tractors and 7,300 open-deck specialized trailers. Patrick Kuehl, executive vice president of Great West Casualty Company, congratulates Gary Coleman, president and CEO of Big Freight Systems Inc. Big Freight Systems was the national winner in the small carrier division (under 25 million miles traveled annually). Winning TCA’s top honor was a humbling experience for Gary Coleman, president and CEO of Big Freight. It showed that company-wide dedication to safety pays off. 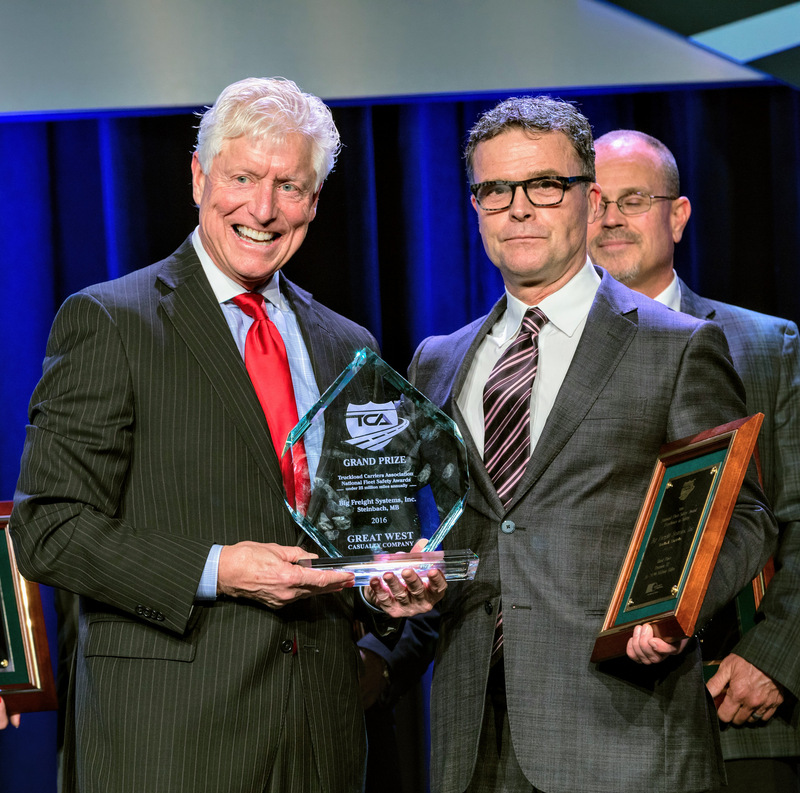 “We wanted to further our commitment to safety; we wanted to show our drivers that we were not just talking about safety, but it was our No.1 priority,” said Coleman upon receiving the top TCA award. 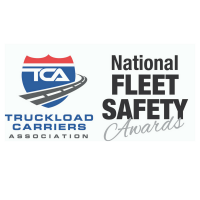 Don noted that on the same day Smokey Point won its second consecutive first-place TCA safety award, it also was a winner in the “Best Fleets to Drive For” competition, sponsored by CarriersEdge and TCA. “It goes to prove that being safe, and being a fleet where drivers want to work, go hand-in-hand,” he said. Being safe is an integral part of the operating culture at Daseke companies, said Dan Wirkkala, SPD’s president/CEO. At Bulldog Hiway Express, the focus on safety starts before a driver is hired, according to Jerry Peterson, the company’s safety director. “We want to find the best drivers out there,” he said. 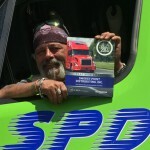 The company reinforces the safety culture with intensive training in defensive driving techniques, and with tools such as inward- and outward-facing cameras and speed gauges to help both drivers and the company monitor safety performance. At J. Grady Randolph, the safety message is reinforced through continuous coaching and the involvement of everyone from executives to terminal managers to dispatchers to drivers, said Mike Harlan, the company’s director of safety and human resources. The payoff of making safety awareness and performance a priority comes in drivers and other motorists returning home safe and sound, and in cargo getting to its destination on time and in good shape. Safe operation reduces operating costs for the company and makes it easier to recruit and retain drivers. The Daseke family of companies includes Smokey Point, E.W. Wylie, J. Grady Randolph, Central Oregon Truck Company, Lone Star Transportation, Bulldog Hiway Express, Hornady Transportation, The Boyd Companies – including Boyd Bros. Transportation, WTI Transport, The Schilli Companies and Big Freight Systems. Each company within the Daseke family leverages the scale of the organization to offer industry the most advanced, safest, and efficient logistics solutions in North America. With Daseke’s scale of operations, national freight network, and modern and efficient flatbed/specialized equipment fleets in North America, the company has been custom-built to meet industry’s unique needs.